After seeing all these different recipes utilizing store-bought pasta (and upset at having been left-out of this Foodbuzz freebie), I was reminded that the average American still thinks that making homemade pasta isn’t possible, and I was determined to prove them wrong. Although I do understand that there is a time and a place for store-bought stuffed pasta and Semi-Homemade/Sandra Lee nights, I also believe that creating homemade, fresh, stuffed pasta is much, much easier than most people think. The key is in the stuffing. If you can make a delicious stuffing for ravioli, agnolotti, tortellini, cannelloni or any other shape of stuffed pasta your little heart desires, the hardest part is over. If you don’t have a pasta roller (or a rolling-pin), buy some wonton wrappers and do it that way. The key is that you’ve done it – you made it, the stuffing is fresh and includes zero preservatives. You get to control what goes in the stuffing. Get creative ’cause the possibilities are endless. Although I did make my own pasta for this dish, the star was the stuffing. It was super simple, quick and very easy to make. We happened to find fresh porcini’s in our local market (a freaking miracle) for about $35 a pound, so we bought two ($8!) and decided to blend those with some rehydrated dried ones and a bit of good old (and too often underappreciated) white button mushrooms. A bit of butter, some fresh parmigiano, garlic, shallots and sage, and you’ve got a fab-u-lous, fresh filling for pasta. Bottom line, if you haven’t tried making your own stuffed pasta, give it a try. Please. Just try. Make your filling by gently sautéing mushrooms, shallot and garlic together in butter until all is soft. Add sage and cheese and combine well. Kill the fire. Taste and season with salt and pepper. Mixture should be reasonably dry, i.e. not saucy, so that it doesn’t soak into pasta but sits nicely in it. Allow mixture to cool before beginning next step. If you want to make your own pasta dough and roll your ravioli from scratch, click here for our foolproof recipe tried and tested many times but, most famously, on a weeknight. If not, take your wonton wrappers, and armed with a glass of water, lay the wrappers out and place a teaspoon of filling in the center of each. Then, follow the latter part of our tried and tested ravioli-on-a-weeknight-recipe. To make the brown butter (noisette) and sage sauce, simply melt the remaining butter in a pan and watch it caramelize into a beautiful brown color, adding julienned sage near the end. Spoon sauce over cooked ravioli/tortelloni and sprinkle liberally with cheese. 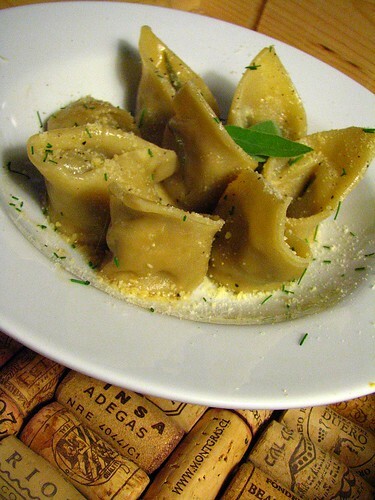 Your pasta look delicious, love the practicality of your recipe by using wonton wrapper. Very clever! 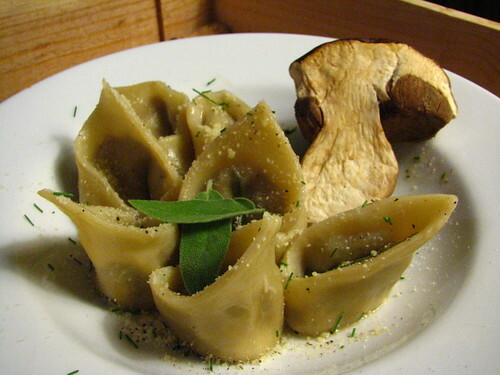 Delicious pasta with mushrooms and sage! I love making homemade stuffed pasta – it’s the best! I’m abashed that I received a package of buitoni pasta… too lazy and haven’t posted yet. It was surprisingly good, but yours looks much better! I have a pasta roller and even got the ravioli attachment but have never tried it yet. You have inspired me. I am laughing so hard about the commercial and paper machei heads…oh gawd, hilarious. This does look so awesome…I love what you’ve done here! When saw the mushroom & read the “stuffed” the foodbuzz agnolottis were the one I was thinking about:-) they were truely amazing! & u have done an amazing job here too with the flavors!! getting me hungry! This dish looks just beautiful, and easy enough for me to try. I love mushroom and pasta (or risotto) and parmesan. Yum. Every time I catch Sandra Lee as I’m flipping through channels, I always think that if she would just give up on the stupid tablescapes, she’d be able to spend time cooking something decent. Who the hell gives a cooking show to someone who can’t cook? Once the investment in a pasta roller is made for the Kitchen Aid, trust us when we a say that pasta WILL be rolled. It will! Nothing beats the taste of fresh pasta. Of course you guys did it up with your made by hand dough and that filling. Mmmm mmm good. Sandra Lee wouldn’t bother using pre-made fresh pasta dough. She’d take a can of Chef Boy R Dee ravioli, season it with a packet, add some liquor, cover it with preshreddded cheese and garnish it with herb-studded Cool Whip! I never get freebies from Foodbuzz either. It probably doesn’t help that I neglect my account though. I am just too intimidated by the site. I’m not always sure how to use it. Too much stuff. Information overload!!! Your pasta looks worth the effort though. I do make my own pasta occasionally. I have an Imperia roller/cutter, but I had a disaster with ravioli once and I haven’t attempted them again. For ravioli I wimp out with the wonton wrappers. For me, the easy party is the filling and I’ve often taken the pre-made pasta wrap shortcut. Looks like your home-made pasta has some ‘bite’ to it. Not wimpy. Love it with the delicious combination of sage and mushrooms. Hey, Joan. That shortcut totally cool… I recommend it! I’m just not a fan of everyone always using the stuff bought at the store. There is a time and place every once in awhile, but i want people to try to make their own b/c it really is easy! Oh my… Fresh porcinis are a rare find around here as far as I know. Almost as pricey as morels! Looks great. I am impressed by the reasonable price of porcini. And I am glad to see you calling that with the Italian name. Most of the English speakers name them cepes … that I believe comes from French. Anyway if I can add my two pence suggestion on making your own pasta, which I strongly encourage: it’s quite easy and rewarding. You really do not need a machine to make the dough. It’s probably faster to hand make it. What you may want to consider is using a machine to “flat out” (not sure about the proper verb) the dough. To achieve a really thin texture with a rolling pin could be tricky and time consuming. I make my own pasta often but I do use a machine for the final job. when the heck did you make this?? was it at home?? ahhhhh this look SOOO GOOOODDD…can you make this down the shore? thank you. good day. That sounds delicious!! You’re right, it is a lot easier than most people think. Last weekend, a friend and I made raviolis and linguine for 10 people in less than an hour and half. And we had leftovers! You are giving Sandra Lee to much credit with arugula. She is definitely a bagged iceberg lettuce chick with the carrots already chopped in them. My favorite part as where they refer to her as Chef Sandra Lee too. Refresh my memory but I don’t think that girl has ever spent a day in a kitchen. My xmas present was the pasta maker attachment for the KA and I have been pleasantly surprised how easy it is to make. Although I have not had a good enough success story yet to justify blogging it. I have not tried the FB mushroom pasta yet but I can bet yours dominates it in every way. I totally agree about homemade pasta. I often buy fresh and dry pasta though – for convenience. I’ve used wonton wrapper for homemade ravioli, but fresh lasagna pasta sheet cut into squares work great too. I’ve also found colored fresh pasta sheets which look great on the plate. okay you guys I just saw this and if you dont make this over Memorial Day weekend- you will both be disowned!!! Amazing looking pasta. Love the combination of flavors. I love making homemade pasta (and blogged about it recently) but don’t do much stuffed; will have to give this a go! Trying homemade ravioli again – and I stress again – is on my soon-to-do list. You make it sound so easy! When I did try it, the cheese filling was fab, but the pasta way too thick, so not fun to eat! Your porcini filling sounds divine! that’s where pasta rollers are SO handy when making stuffed pasta. you get a consistent thickness of your pasta. I usually do mine on “6”or “7” and do a test one to make sure it works well. you don’t want it too thin but you def. don’t want it too thick. 6 or 7 on a kitchen aid pasta roller attachment is usually perfect. give it another try! also, be careful w/ how much stuffing you put in your pasta. over-stuffed ravioli’s just blow up when cooked! I am all for making 2 porcini go along away – thats what we do, invest in a beautiful one and then mix it with some decent others. These look top, very impressed with your h/m pasta the filling sounds just delicious. oh and the sage and butter sauce !! Just Beautiful! And a hearty guffaw. Thanks. Would anyone like to join me in creating an I Hate Sanda Lee Fan Club? Beautiful pictures and recipe! I love making homemade pasta too, but never has it turned out as pretty as your shaped masterpieces. 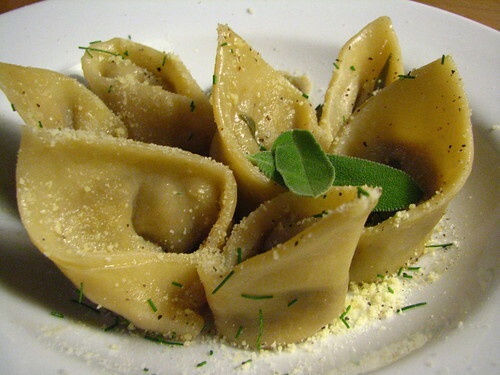 Nice ravioli dish. I love the sage/butter combo… and score on the porcinis! Great tip on not over-stuffing too (you just saved me from several explosions!). This looks totally ace. I’m going to try it. Not today, not this weekend, but some day soon. we hope you do! please let us know how it goes and have faith – it really is easy! Now as for Sandra Lee, first of all I am still laughing, but I also want to say that one of my hobbies is table SETTING and collecting china, glass and silver. Her TableSCAPING gives it a bad name. Oh well, what you gonna do? I love making fresh pasta! You’re right. I think people are needlessly intimidated. I’ve also used wonton skins when I’m feeling lazy. They are such a great shortcut! OK, it’s been too long since I’ve made ravioli. Thanks for the inspiration!